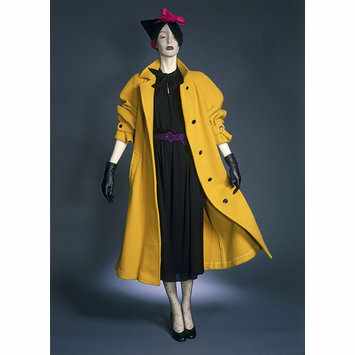 A yellow wool overcoat, unlined, over a black jersey dress with purple suede belt. Black wool and velvet hat, with separate netting veil and pink jersey bow. Worn with black patterned tights and black pumps. 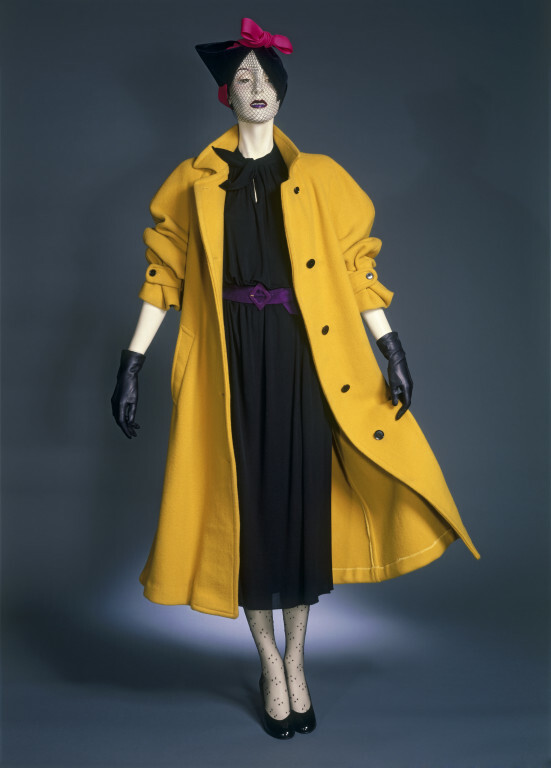 This complete outfit was one of 25 complete ensembles representing British fashion design from Winter 1979. All the accessories, including gloves, stockings and shoes, were donated at the same time, along with an Adel Rootstein mannequin. Ensemble for Winter 1979, Sheridan Barnett & Sheilagh Brown. De la Haye, Amy (ed.). The Cutting Edge: 50 Years of British Fashion 1947- 1997. London, England: V&A Publications, 1997 p. 202.